Hey guys! 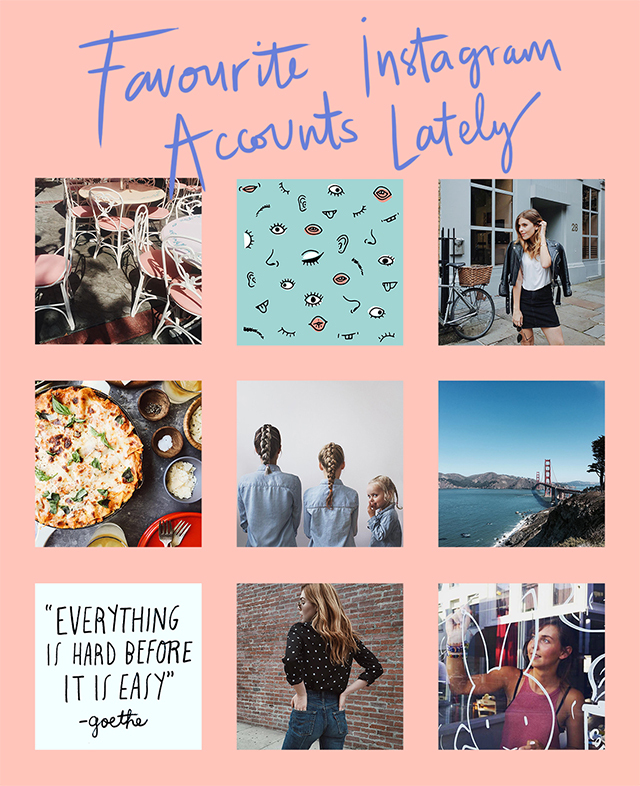 It's been a while since I did a post about finding some inspiration on the web, so I thought I would share with you 9 Instagram accounts that I've loved following lately. Let's be honest, I'm now addicted to Instagram more than I was with Pinterest, and I think what I love is the fact that we're following these people's lives little by little, discovering a bit more about them every time. I know that we always choose to show the best shots, and that an Instagram feed doesn't really tell our true life, but I don't really care because to me, that's the beauty of it! Ali Labelle is the creative director at ban.do and I found her account through Jen Gotch, the owner, that I'm following too. I guess I'm fascinated by LA and how people live their life there so that's definitely a bonus, but I also love the way she sees things. So many of her colourful photos are little details of her life and habits that it makes me feel like I'm having a proper insight into her personal life. Voyeurism did you say? Yes, maybe a little. I found her account last week, and I didn't hesitate in following her! For all the creative people out there, she is to me the kind of designer with a cool and trendy style that I never get tired of. Her feed is really well thought out and she shows a good mix of everyday life shots and design work that she creates. Can't wait to see more! Carrie always seems to be traveling or eating some amazing food. Plus, her style is spot on and she always looks stunning, even when she's posing on some dirty pavement. I've been following Wish Wish Wish's fashion blog for a while now, but her Instagram account is one of the best ever to me! Talking about tasty food, Jon's feed is full of it, and it's all recipes of his own, which makes it extra special. Sometimes I actually hate following him because the moment I see one of his delicious dishes, it makes me instantly hungry! He's been traveling quite a lot around Europe lately, but rest assured that the food shots will come back. This is one of the most poetic accounts I'm following. You can tell how much every shot has been carefully thought of and I particularly like the regular photos of Dominique with her two little girls, all in the same outfit! Alizée was in the same design school as me years ago, and I've loved following her adventures since I discovered her Instagram account. Lately I've been even more eager to see what she's up to as she's been traveling EVERYWHERE with her boyfriend. I'm kind of jealous actually. Her photos definitely take me away and sometimes that's all I need. Another one that I discovered really recently and I loved her account and what she does straight away. It's always nice to find a successful business woman dedicated to helping freelancers, and her fresh and inspirational snippets are always a pleasure to see. Plus, she shares the stories of other creatives regularly. Her feed is such a beautiful and inspiring world! I basically want to be her. Courtney is an actress and blogger in LA (yes, I love LA), and she shares with us a bit of her life through stunning photos with warm hues. Kelly is super talented and she does have an amazing job. You can find her painting on walls and shop windows all the time, and you're sometimes lucky enough to have a sneak peek of the beautiful illustrations she creates for children's books. She's living the life.